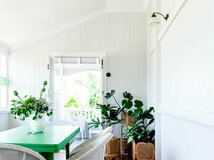 When Jacinta Woods and Sonia Warner, co-directors of Woods & Warner, were asked to design the interior of this Rose Bay home in Sydney, it was the start of a bold artistic collaboration that resulted in a fearless finish. 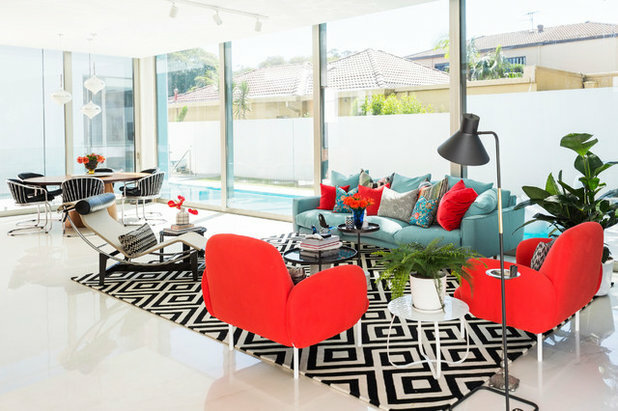 The owners – a husband and wife with two grown-up sons – love mid-century design and were not afraid to go with punchy patterns and bright splashes of colour throughout the interior. 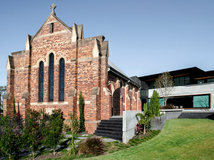 Tony Legge, principal architect of Legge & Legge Architects, began designing the family’s home in 2011. 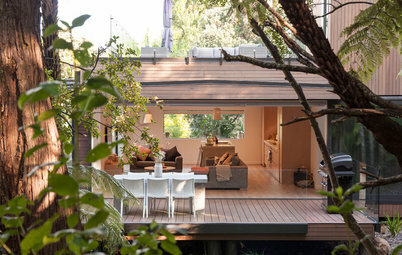 Legge’s architectural vision involved a complete knock-down rebuild, so the family of four moved out during the build. 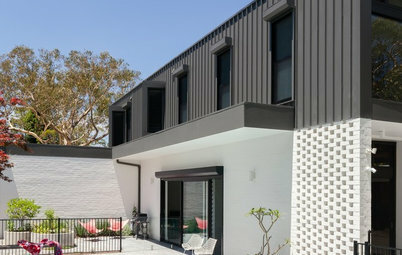 Woods & Warner joined the creative team in 2013 and the build finished in 2016. 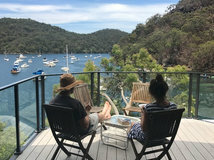 The designers added some finishing flourishes in 2017 with minor decorative pieces, and the family of four is now happily ensconced in their new home. 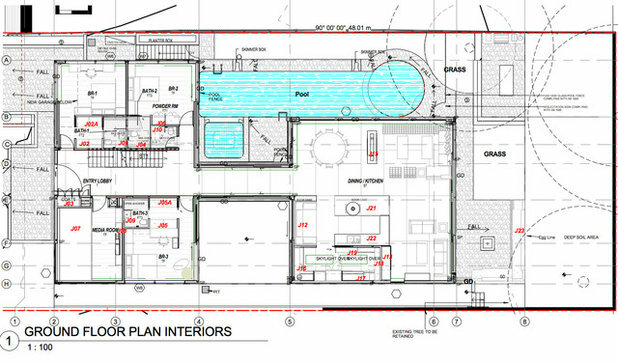 The ground floor is home to three bedrooms, the media room and living/dining/kitchen areas. 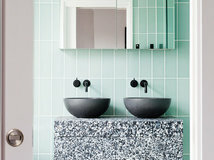 Minimal, however, is unlikely to be your first impression of these dazzling interiors – the rich colours and bold patterns are what instantly command attention. 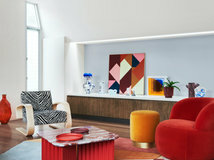 Woods & Warner used injections of bright primary colours in the form of furniture and soft finishes to breathe life into the monochromatic base palette. Considering Kirby and Bauchet’s passion for colour, the designers’ approach sounds counterintuitive, but it left their clients thrilled. Kirby and Bauchet travel frequently and already had a collection of artwork and vintage posters, which Woods & Warner added to during the build. In the formal lounge area on the ground floor, a Ned Kelly masterpiece takes pride of place. It was painted by Adam Cullen, the late, great Archibald Prize-winning Australian artist. Kirby and Bauchet were adamant that they did not want a homogenous style of decor to be applied, cookie-cutter style, throughout their home. 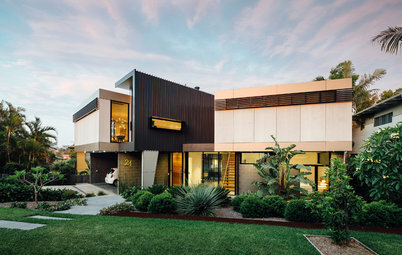 “Each room needed its own style and personality,” Warner explains, adding that the owners and designers referred to Houzz to visually articulate concepts. “It’s a useful tool for clients and designers to communicate their ideas in a relaxed fashion,” she says. 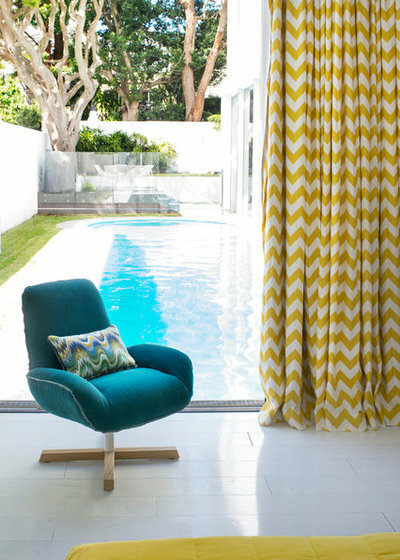 As well as colour, patterns and textural accents play an important role in delineating spaces and linking rooms. This guest room and ensuite on the ground floor are united by bright pops of yellow, which you see in the joinery, chevron-patterned curtains and sunny velvet bedspread. 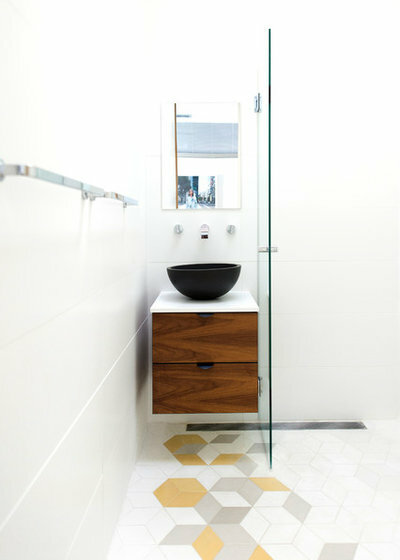 Woods & Warner carried this vein of yellow from the guest room into the guest ensuite by virtue of the floor tiles. 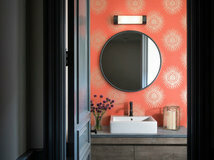 These visual cues – in the form of colours and patterns – link each space and express the characters who inhabit them. 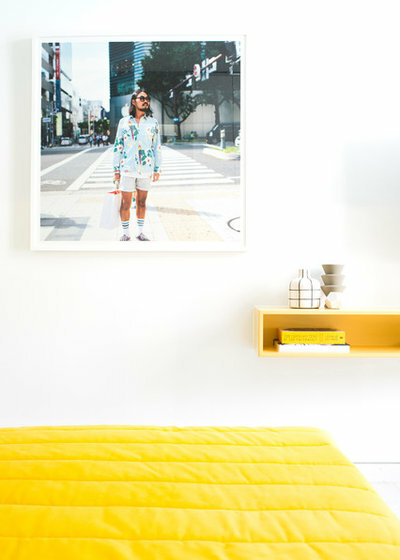 It’s a perfect example of how colour can be used as a signature to express someone’s individuality, and signal when you are entering or leaving their personal quarters. 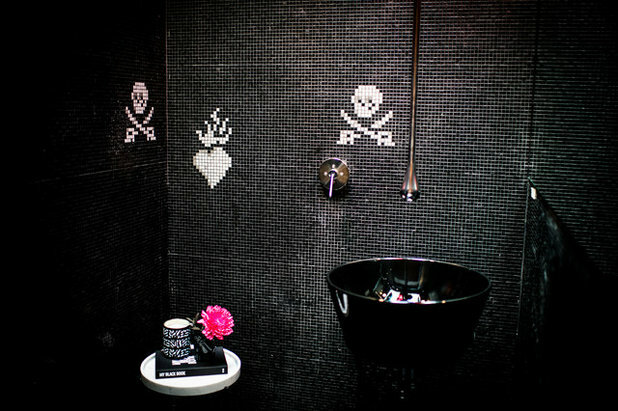 Nestled near the guest room on the ground floor is a striking powder room, resplendent in all its rebellious glory. 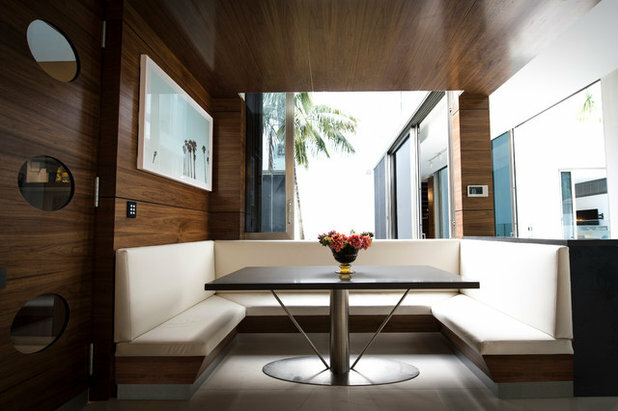 The glittering black mosaics and dark finishes of this shared space sit in stark contrast to the adjacent private sleeping quarters, which are light and airy. Like the powder room, the dark colours of the nearby media room on the ground floor give a nod to the space’s shared use. 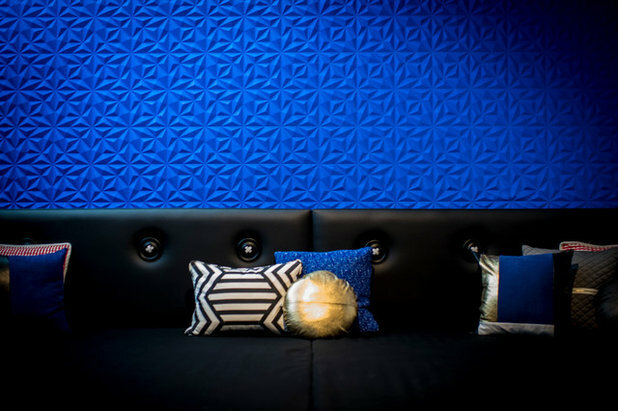 Here, black and midnight blue take centre stage, while the softness of the textured wall treatment tempers the punch that’s packed by the stronger colours. Likewise, the sons’ bedrooms reflect the boys’ different personalities, tastes and styles. 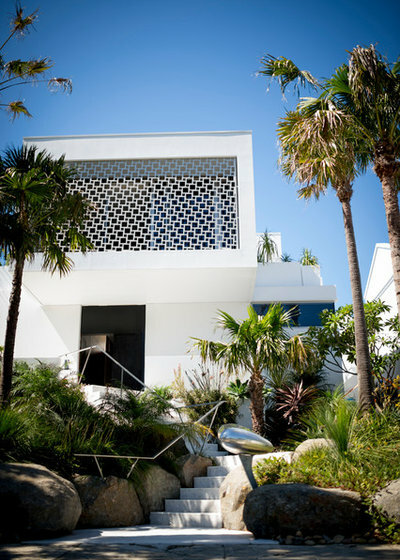 Both are located on the ground floor and vary greatly in their patterns, textures and colours. 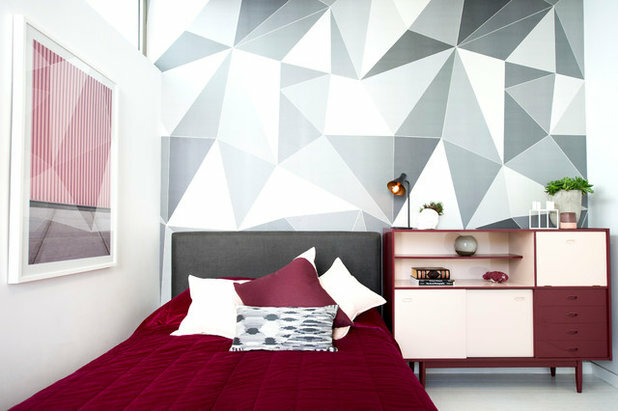 The first bedroom uses graphic geometric patterns on a large scale in the tonal grey wallpaper and slabs of single colours, which you immediately see in the plush crimson bedspread and complementary bedside table. 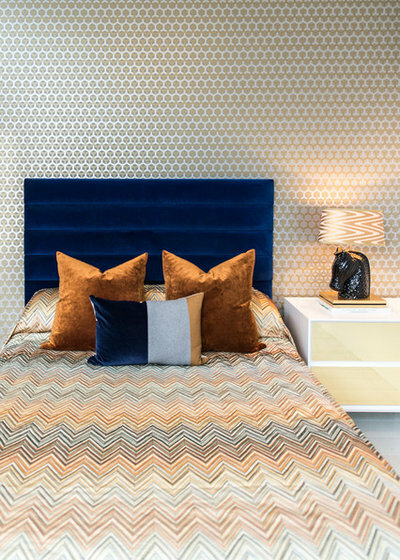 This bedroom, in contrast, was an exercise in using pattern on pattern. It features a fine gold wallpaper and an intricately detailed herringbone-style bedspread with multiple colours woven through. When Woods & Warner joined the team in 2013, the owners’ teenage sons were entering their final stretch of high school. When the build finished in 2016 they had graduated. Each bedroom and ensuite reflects the sons’ maturity as young adults rather than teenagers. 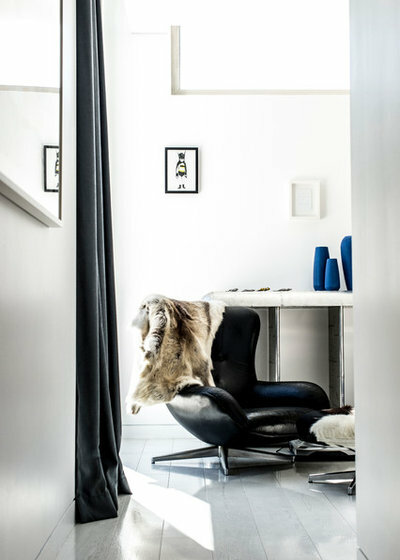 These spaces juxtapose punchy patterns that evoke the playfulness of youth with sophisticated finishes and furniture, such as this marble table, black leather armchair and dark drapery. Kirby and Bauchet saved their sons’ artworks from when they were children, and it is these treasured pieces that adorn the boys’ rooms. 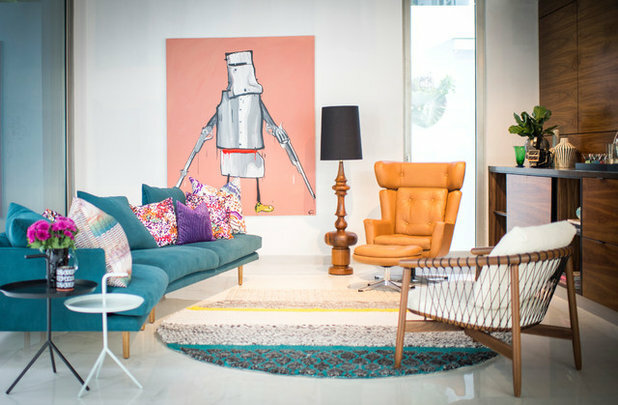 “It’s always nice that you can have a gallery of pieces yet still keep the essence of a family home,” Warner says. 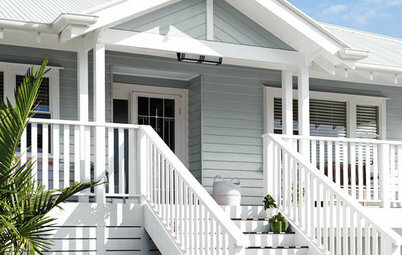 Separate his and hers master bedrooms crown the upper level, which is split into two flanks. 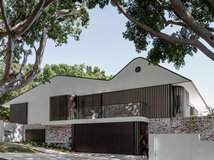 These sleeping quarters are connected with a bridge that frames views of either side of the property – a design reminiscent of the neighbouring houses that Mexican artists Frida Kahlo and Diego Rivera shared. 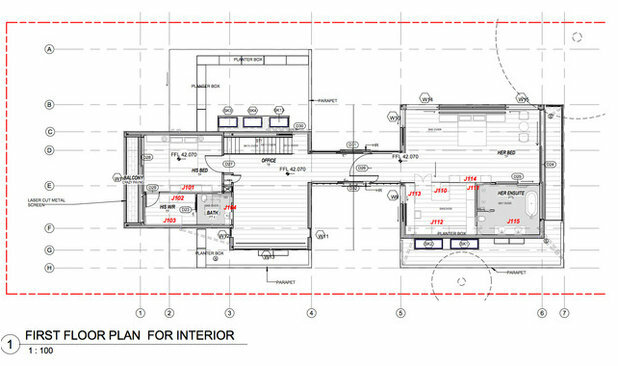 The bridge between the two rooms can be seen clearly on the first-floor floor plans. 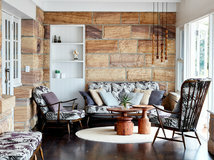 “Having [their] own space meant there were no compromises with colour palettes or finishes. 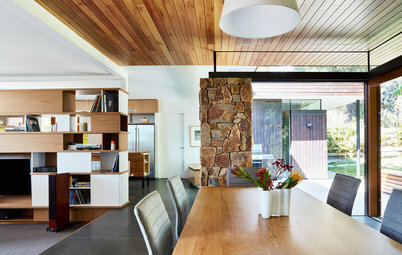 Each has a mid-century influence, while having their own distinctive male and female design schemes,” says Woods. No doubt you immediately notice the inherently feminine quality of this bedroom and ensuite. 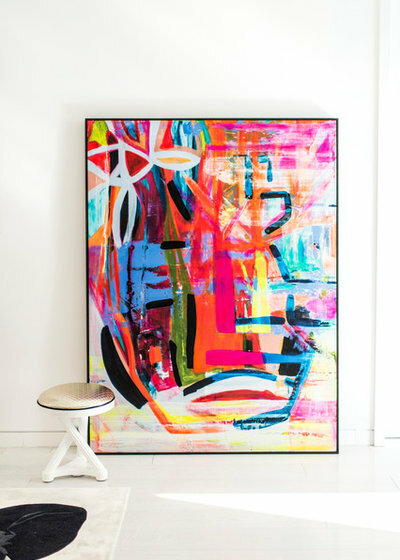 The space echoes the monochromatic colour palette used on the ground floor and introduces rich pops of colour through artworks and soft finishings. White, voluminous curtains enswathe the floor-to-ceiling windows in the female master bedroom, and Woods & Warner custom designed a chaise, which offers an elegant repose near the freestanding stone bath. 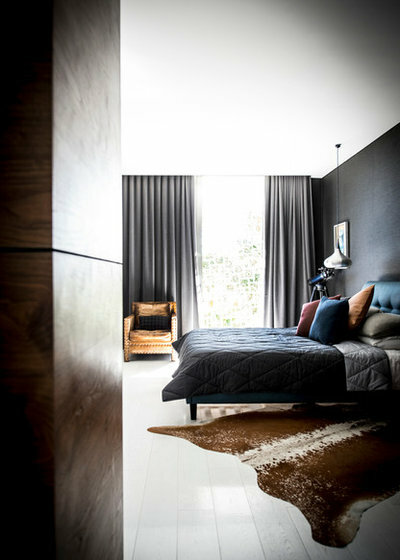 By contrast, the masculine master bedroom and ensuite embody an entirely different style and colour palette. 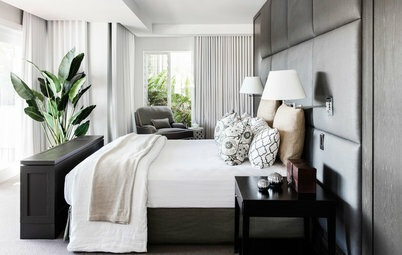 Compare the two sleeping quarters and you’ll find this space conjures a more sombre, masculine feel. Moody, smoke-coloured curtains drape the full-height windows and hang in perfect unison next to the brooding grey accent wall. 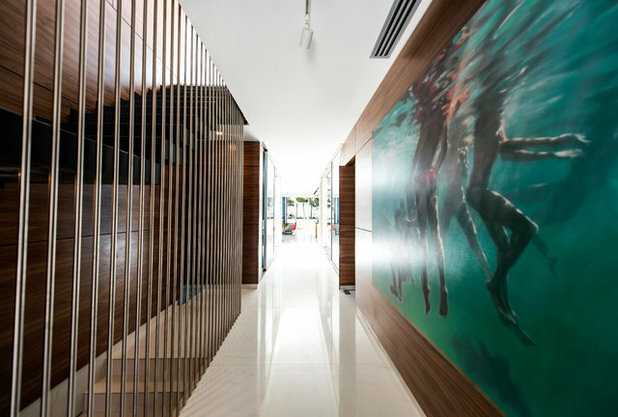 “Each room could have new fabrics, furniture and artwork without feeling overbearing and misplaced,” Woods says. 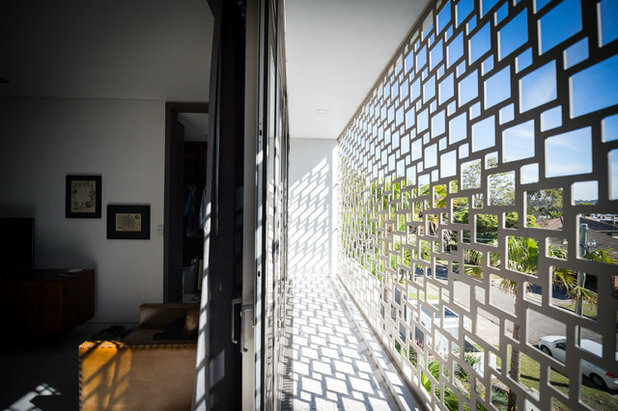 The laser-cut screen designed by Legge, which grabs your attention at the home’s facade, makes a second appearance in the masculine master bedroom. This time we view it from within and, rather than looking at a pattern, here we look through one. 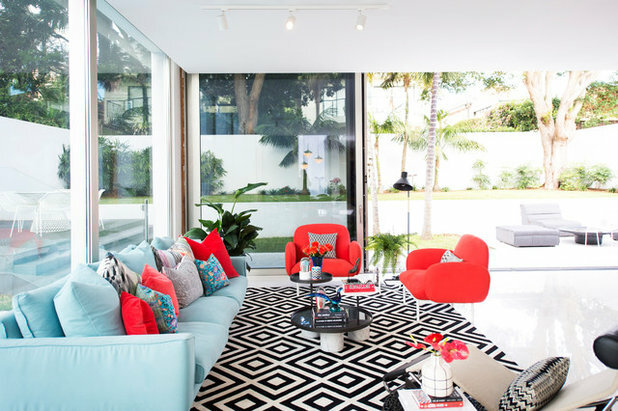 What aspects of this mid-century Palm Springs-inspired home do you love? Tell us in the Comments below. And don’t forget to save your favourite images, bookmark the story, and join in the conversation. 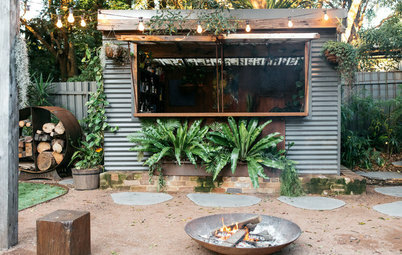 An absolutely beautiful edgy and creative home. Wow - the laser-cut screen!